New Irish Releases for the month of June. #Indulgeinbooks. 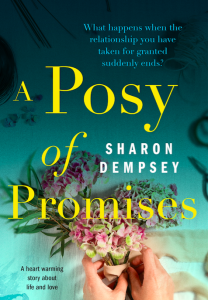 A Posy of Promises is Sharon Dempsey’s first contemporary women’s fiction novel. A Posy of Promises is the first in a trilogy. ‘Sharon Dempsey writes with such warmth and affection it’s hard not to be bowled over by her cast of characters as they deal with all life throws at them. Please tell me there will be a follow up and we will get to see what happens next? I think there is so much more to come from these women. I have an endorsement on the cover of this book! So gush, gush, I love it. 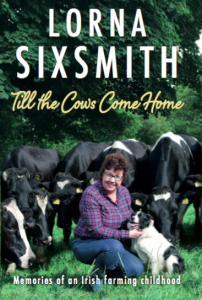 With a newborn baby in tow, Lorna Sixsmith and her husband swap their office careers for the dream of ‘the good life’, returning to Lorna’s ancestral farm at Garrendenny, Ireland. Now Lorna’s children play in the same fields – and their adventures echo those of generations of Sixsmiths before them. The discovery of rural life proves more transformative, overwhelming and enriching than anyone could have imagined – but, above all, life-changing. A truly ‘down to earth’ account of country life. A rare and lovely glimpse of living in rhythm with nature, the seasons and the farming calendar. Gently humorous and deeply personal, one woman’s story of leaving her comfortable urban life to re-root herself in the land her family has farmed for generations. Lorna brings to life the men who ploughed, tilled and harvested, who loved to work the fields with horses, never quite taking to tractors. Also vividly portrayed are the indomitable women who churned the butter and kept the chickens – selling eggs to earn their ‘hen money’. Peppered with chat about the weather and the price of cattle, this insightful, witty book gives an authentic sense of the rituals and the unchanging aspects of country life. I got an advance copy of this book. Thank you to Evie. 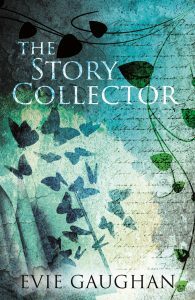 It is a gorgeous tale that lingered with me, for all the right reasons. Beautiful cover, lovely book. Abandoned by her parents when they resettle in Meath, Mary O Conaill faces the task of raising her younger siblings alone. Padraig is disappeared, Seán joins the Christian Brothers, Bridget escapes and her brother Seamus inherits the farm. Maeve is sent to serve a family of shopkeepers in the local town. Later, pregnant and unwed, she is placed in a Magdalene Laundry where her twins are forcibly removed. Spanning the 1930s to the 70s, this sweeping multi-generational family saga follows the psychic and physical displacement of a society in freefall after independence. Wit, poetic nuance, vitality and authenticity inhabit this remarkable novel. 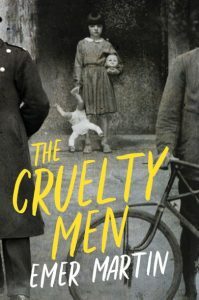 The Cruelty Men tells an unsentimental tale of survival in a country proclaimed as independent but subjugated by silence. 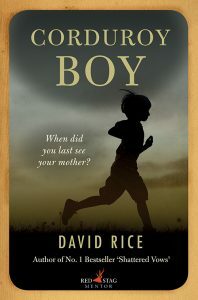 Corduroy Boy is a coming-of-age novel in which a scrupulous and deeply-troubled Catholic boy grows gradually to manhood and maturity, mentored by a dedicated teacher, while both his family and his elite boarding school lurch towards terminal decline. Twelve Thousand Days. A Memoir of Love and Loss. Éilís Ní Dhuibhne PUBLICATION DATE 28 June 2018. 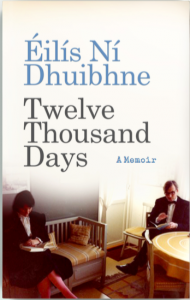 Éilís Ní Dhuibhne’s candid and moving memoir tells the story of her thirty-year relationship with the love of her life, internationally renowned folklorist Bo Almquist, capturing brilliantly the compromises and adjustments and phases of their relationship, and of how he died. Twelve Thousand Days is a remarkable story about love and grief, shot through with wry and sharp observations on Irish life, culture and morality.